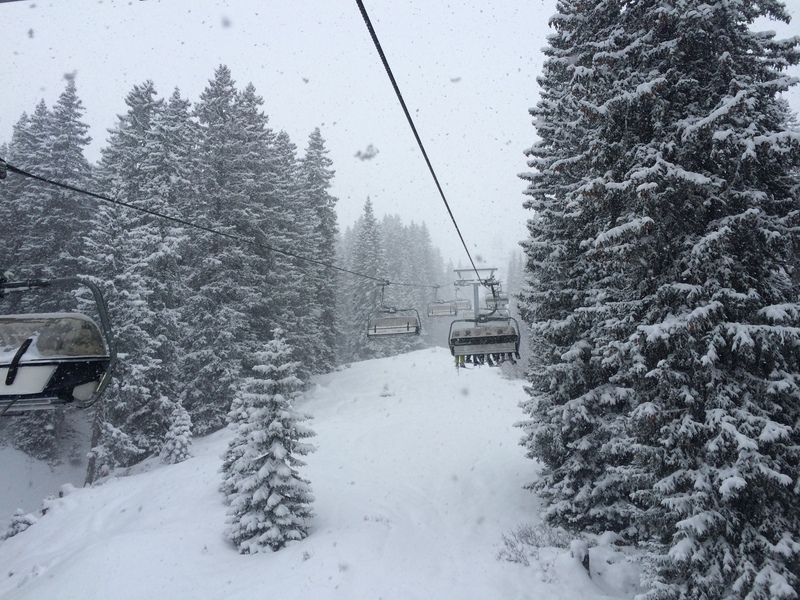 Face down in the white, skis at odds, snowflakes up my left nostril, I practiced mindfulness and observed silence. The silence of the mountains. The silence of a metre of fresh snow. The silence of The Instructor, a relentlessly positive man, finally lost for words. Skiing is suicide and I am not ready to die. Not the people – the language. You see, learning French at my age had given me ideas. 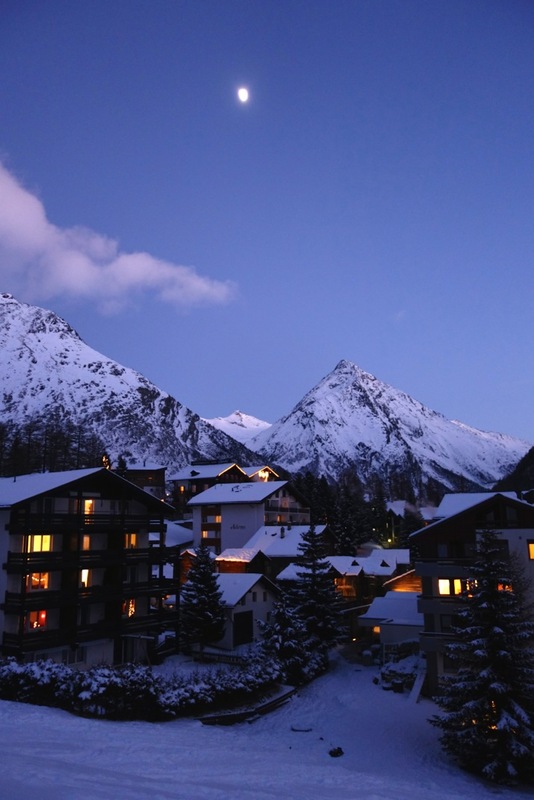 I imagined that with hard work, determination and a pair of comfy new ski boots, I would come out the other side of a 10-day Christmas ski holiday in Austria and Switzerland able to ski like I can speak French – artlessly but well enough to get by and have fun. Turns out that my fear of injury is very much greater than my fear of failure. It goes against nature. Mine, anyway. Do people not realise how dangerous this sport is? Before we even arrived in Austria we saw evidence in a pretty Swiss ski village where we stopped for a sandwich and observed an alarming number of people limping about on crutches. “This is just weird,” said Large. How had all those people injured themselves? The ski season had barely begun. The mountains were green and not at all snowy. If this wasn’t some kind of “take the waters” kind of spa town, we were in a very dangerous place indeed. We got the flock out of there before anyone could break an ankle. It wasn’t easy folding the family back into the car with five bags of winter clothes, five ski helmets, five ski jackets, five pairs of ski pants, Christmas presents, secret Christmas presents and Sabbatical Man’s brand new pair of skis plus the odd electronic device, two pairs of ski boots, bags of books, colouring pencils, blank paper, bags of pineapple lumps, three special blankets, three pillows, various soft toys, some chocolate and five cheese and salami sandwiches. 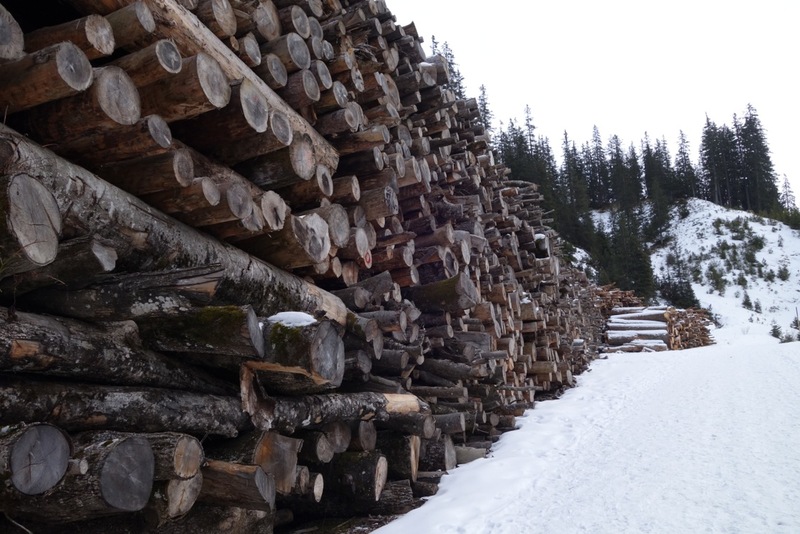 We continued on to Zürs – high up in the Austrian Alps and one of the few places to have snow in the week leading up to Christmas. What a charming village with its chocolate box setting and a lovely family-run hotel that offered the perfect balance between warm hospitality and military efficiency. But there was already blood in the streets – and not just figuratively dripping from the furs and diamonds. Actual human blood. All over the show. 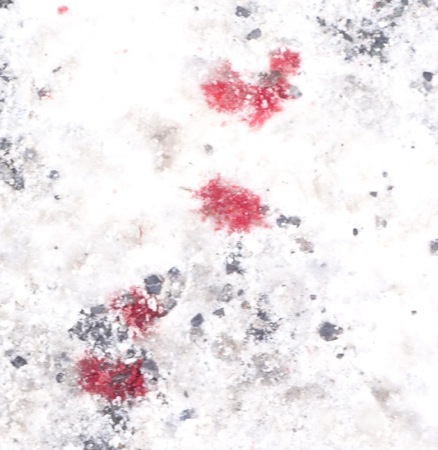 There was also blood on the pistes. On his first day out, Sabbatical Man helped a crashed woman who had so much blood pouring out of her mouth that he couldn’t understand a word she was saying. Things improved when she switched to English, but still. There were litres of blood in the anecdote shared by my French friend holidaying in the same town: her friend severed his femoral artery in a freak ski accident here (picture early Peter Jackson flick). They had to close the piste because there was so much blood in the snow. He survived, by the way, the friend with the slashed artery. Austrian snow rescue is top notch. There are millions of rescue helicopters just waiting to scrape up ski victims within seconds of their smash-ups. The Instructor shared bloody stories too. Sometimes The Instructor said too much. 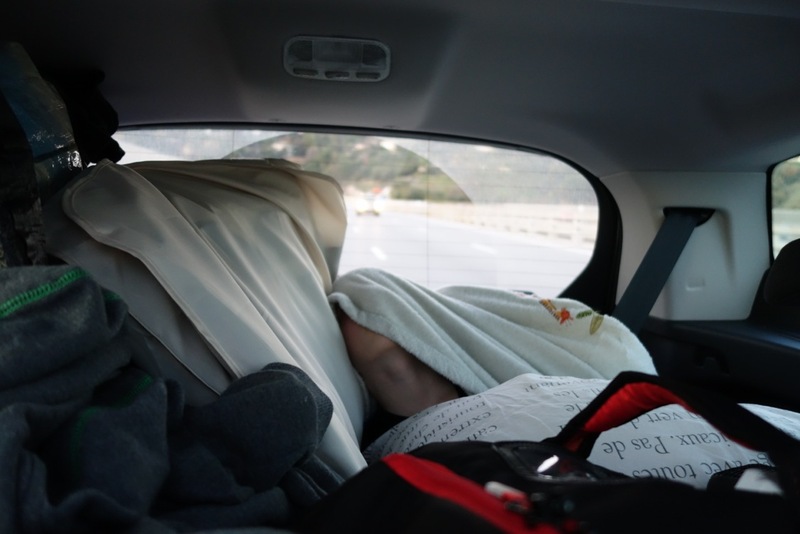 Then he began listing his brother’s terrible, horrific ski injuries and I had to mentally start counting backwards from 100 in French (which is completely impossible) to drown him out. Extreme sport? Horrific injuries? Blood in the street? Any sensible woman would pack up her family and flee to safety or at least confine everyone to tobogganing and après-ski activities. 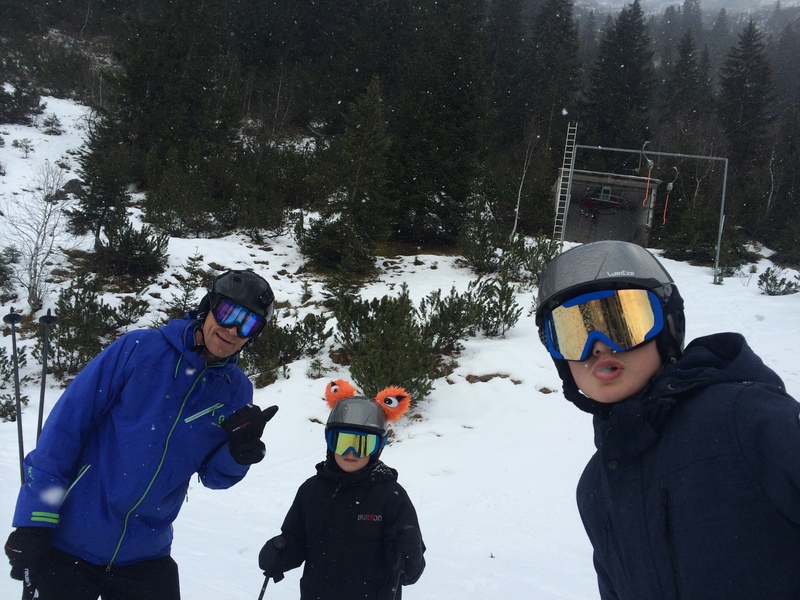 Instead, I encouraged the boys to stick with ski school and praised them and their father as they progressed higher into the mountains with each day, while I wombled around the learner slopes. I had to toughen up down there to deal with the queues. We’re talking about a different species of child here – and I’ve known some monsters. I soon learned to adopt a Queen Elizabeth II stance, leaning heavily on my poles to block the brats who spiked me with their poles, clattered over my skis and shoved me brutally to one side in their desperation to get in front. These six-year-old future barristers, surgeons, Ministers of the Crown, oil magnates and mafia overlords were astonished to find themselves momentarily thwarted in their path to the top of the queue, the mountain, the world. Back at the hotel, casualties were mounting at an alarming rate and marriages were suffering. First to go down was an angry English woman who shattered her knee so badly she needed a kilo of steel to shore it up – on day two of her 10 day holiday. Her husband was philosophical. “We’ve been skiing together for three decades and it’s the first time something like this has happened,” he said at lunch, cheerily shrugging on his jacket and heading outside, his wife following him with her eyes. Next was the oil company executive who usually breakfasted at the table behind us. “Daddy will do his best to be back from hospital tomorrow,” his wife cooed to their little princess. The poor German woman from the table by the window tore up her knee slipping on ice in the street! She was a marvel at stretching her trousers right over top of that huge knee-brace but her sour-looking husband rolled his eyes as she limped up to the breakfast buffet for the second time. The dining room was starting to look like a war hospital and I know you think I’m exaggerating but this one time the truth is good enough to make it into the story. And still, faced with the bloodshed, out we went every day. I decided to ramp up the cost of what was already turning out to be the most expensive holiday of our life by booking several lessons with The Instructor. What a man: two metres of good looks, patience, youth and speed, hand-braked on the easy slopes with a woman his mother’s age who could not follow simple instructions. I tried. I really did. I pushed myself. I took it easy on myself. I smiled and looked at the mountains. 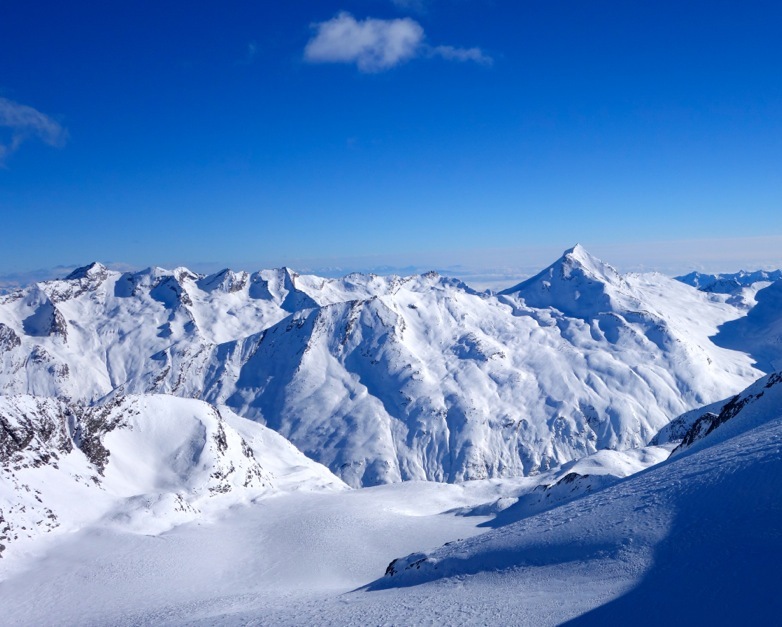 Time after time, I shook out my shoulders, breathed out the fear, pointed my skis downhill, leaned forward, opened my arms up to the valley, felt myself gather speed… and panicked. 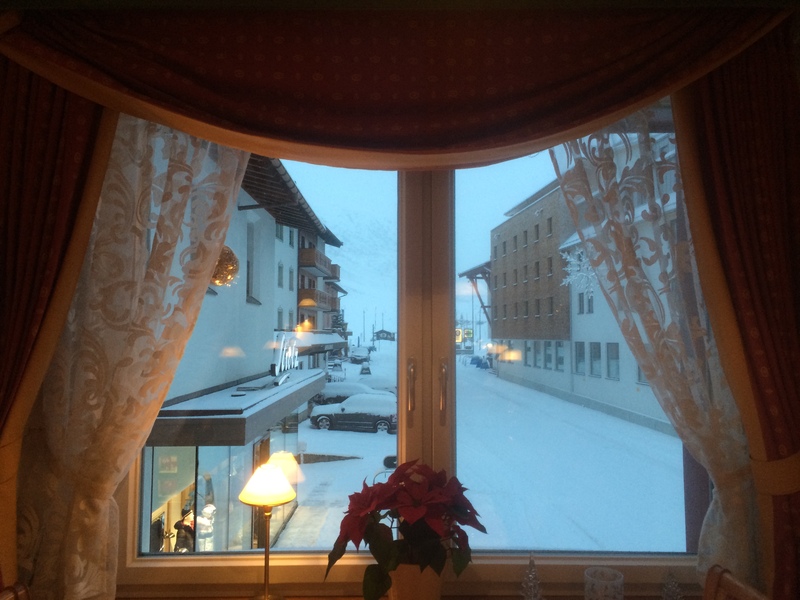 On Christmas Day, I suggested that we have a leisurely family ski morning after presents and breakfast – which everyone was keen on until discovering that we would have to catch a bus to find a slope flat enough for me. “Can’t we go with Dad?” whined Large. “Not the beginners’ slopes!” said Small. “Mum it’s just that you are not a very good skier,” said Medium. 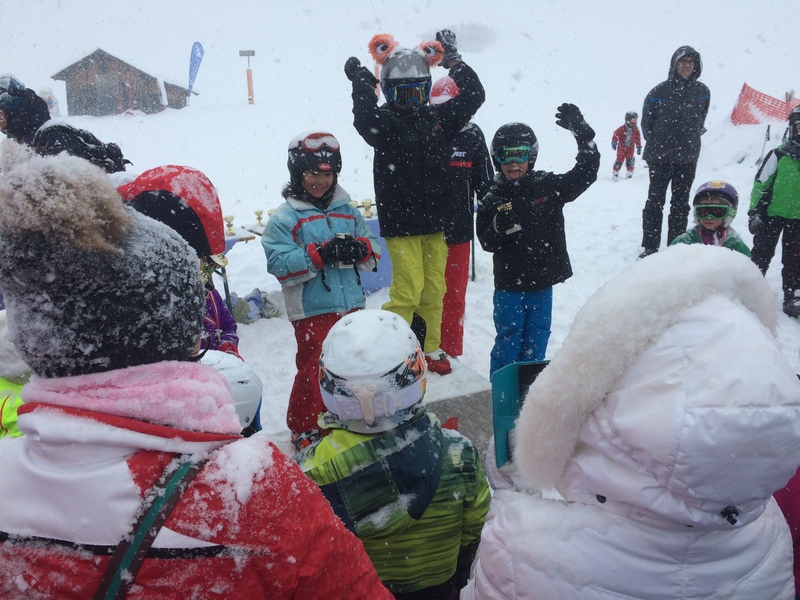 They humoured me because I am the boss of them and it was fun doing my enormous turns and watching my family zip away down the slopes, seeking out the little bumps and jumps to try to make it interesting. On the last day in Austria I decided that I had made enough progress to propose that The Instructor guide Sabbatical Man and me on the run between a neighbouring village, Lech, and our wee village, Zürs. Large had done this run a couple of days earlier and was buzzing about its ease, fun and breathtaking views. He did it in the sunshine on hard-packed snow. 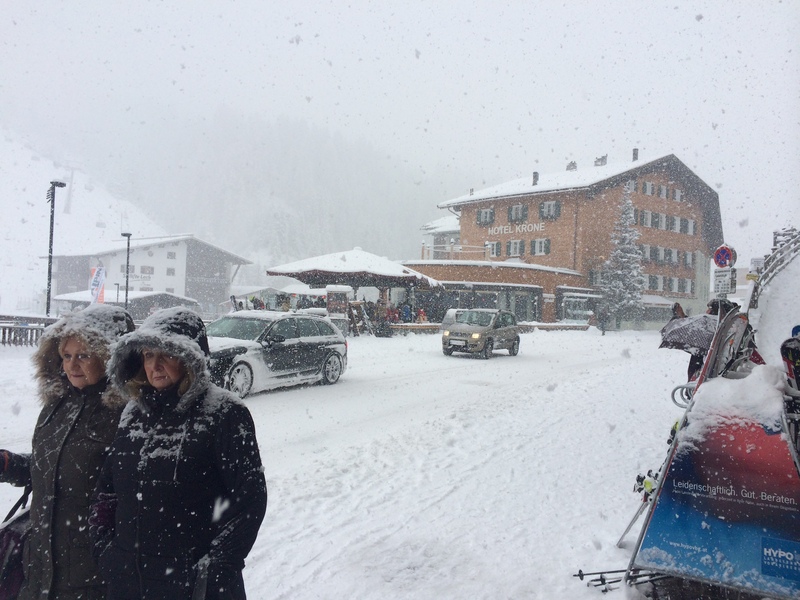 We did it in low cloud, zero visibility, moderate snowfall and that skier’s dream: a metre of fresh powder. Excellent if you’re a pro – nightmare if you are a beginner because you have no idea where the ground is. 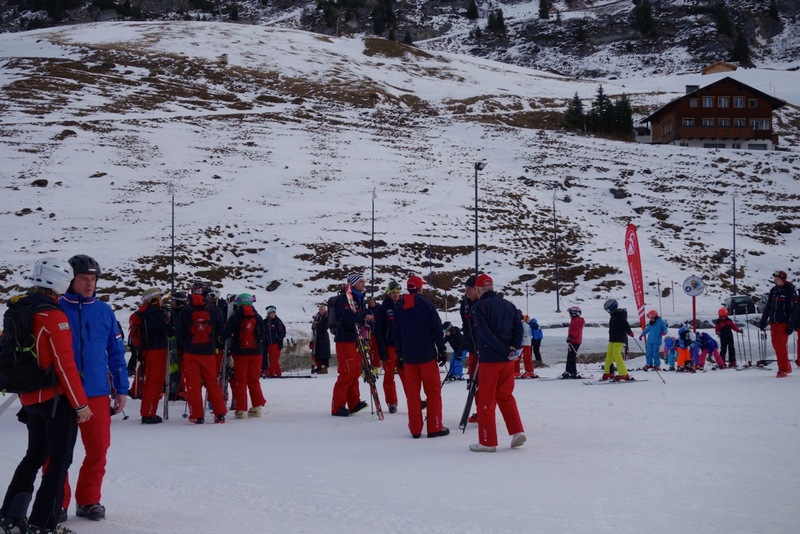 Did I mention it is a red piste? Red is for danger. Red means stop right there. I could not tell up from down. My glasses frosted up, my jaw clenched. I fell forward, backward and sideways. I fell up. I fell down. That was the first 500m of, I don’t know, five kilometres? A hundred? We got to the end about 50 hours later and I was so wiped out that I could barely drum up a thank you for The Instructor who may have lost his words but never his patience. Sabbatical Man had gone ahead to see our boys compete in the end-of-week ski school races and The Instructor and I arrived just in time to see that all three had placed either 1st, 2nd or 3rd in their races. Feeling very proud, I reached for my phone to take a picture. Stupid, stupid, stupid. Instead of safely zipping it into a pocket I had slipped it into a deep internal compartment inside my jacket to keep it warm. The Instructor and Sabbatical Man thought it was lost forever but this crappy day was not going to get any worse. I grabbed Sabbatical Man’s phone in the now heavily falling snow, downloaded an app and tracked my phone. The two of them glanced back up at the darkening sky. The chairlifts were due to close, the snow was deep and smartphones do not like the cold but there is a knight at the heart of every horseless man so off they went on my futile quest. Half an hour later it was back in my hand, bless them – found safe and sound, beating its little electronic heart out deep in the snow, high on the side of the mountain where I had done my last face-plant. My mood lifted. 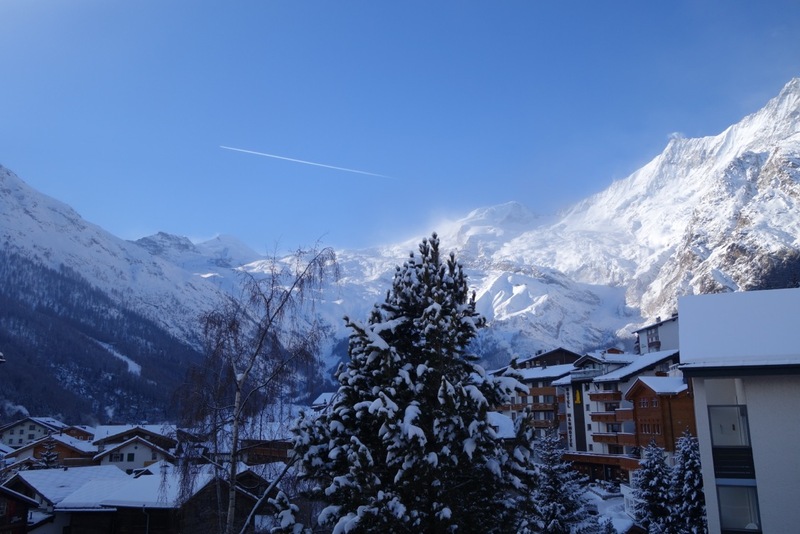 Skiing was done for the day, a warm restaurant awaited, tomorrow was a travel day and Medium was showing signs of the ‘flu which meant I might need to take a break from skiing in our next destination, the Swiss mountain village of Saas-Fee. And that’s what happened. 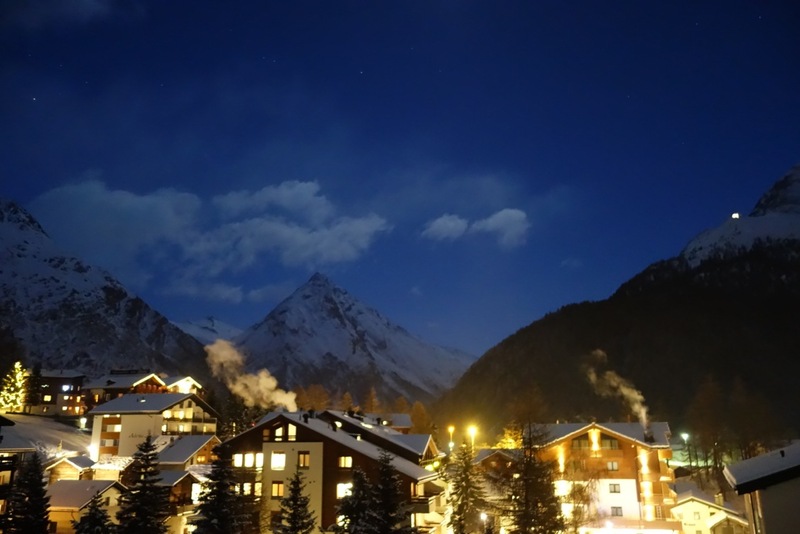 So, no, I didn’t learn to ski very well but I did learn that I love the mountains in moonlight even more than sunlight, I love the tiredness and shared experience of a day on the slopes, I love the simple pleasure of tomato soup or hot chocolate or hot wine when you come in from the cold. I even love the cold. I am also starting to forget what I was so scared of so I’m not giving up on this suicidal sport just yet. 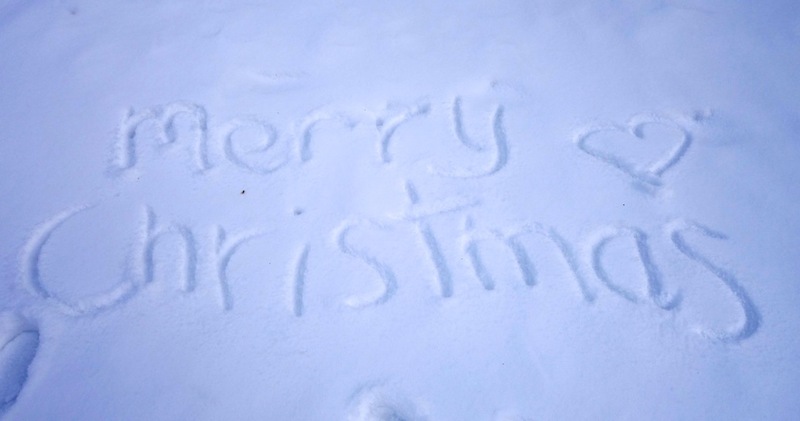 And did I mention that it snowed prettily on Christmas Eve and all of Christmas Day to make our first family White Christmas all that we had hoped? Happy New Year and thank you so much for reading in 2014. 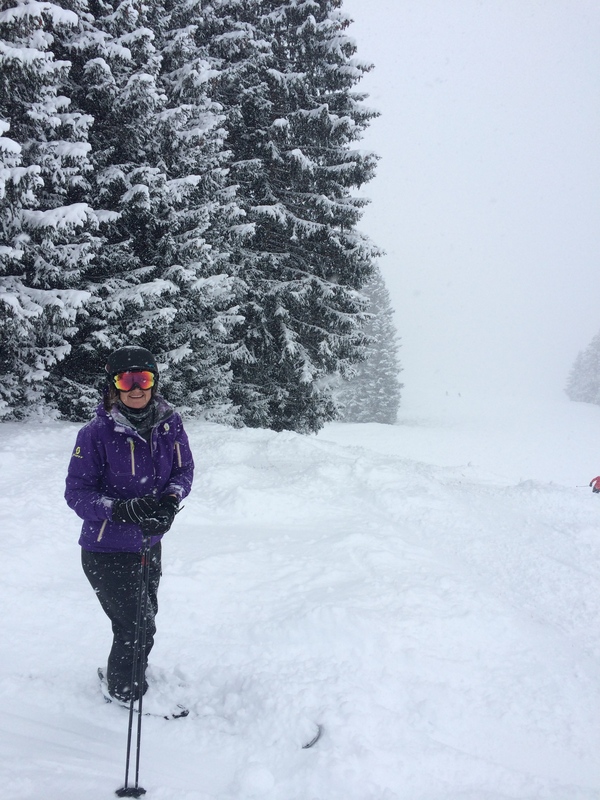 Brilliant Karen – I feel a real sense of kinship with you now after spending a challenging & ultimately unsuccessful week on the snow this year! I have gleaned a speck of hope from your post – perhaps I can persevere another round and of course be thankful no blood has been shed – yet! Matt is busy planning us an overseas excursion for next nz summer ….. I’m kinda staying quiet (another challenge) and trying to channel your positive summary – hot wine!